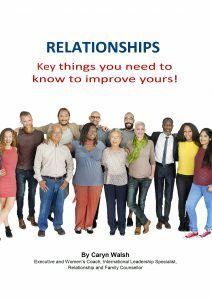 Fascinated with Organisations, communities people and relationships, Caryn regularly writes e-books pertaining to people’s lives and business challenges. Her e-book topics vary significantly. 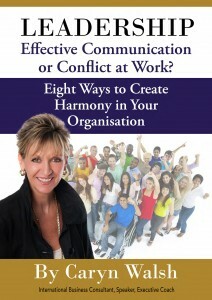 Some focus on having successful relationships, managing communication and dealing with conflict at work. Others describe highly performing leadership and how to build effective collaboration at work. Yet another looks at the impact of technology on youth today and how to incorporate it into present day family life. Her latest e-book, entitled ‘Thrive! 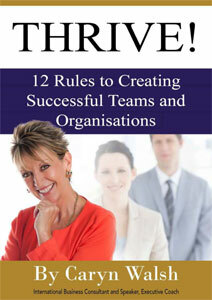 12 Rules to Creating Successful Teams and Organisations’ is action packed with practical strategies and thought-provoking ideas about how to have a truly successful and thriving business by growing your people and creating financial freedom at the same time. Many leaders, at all levels, have lost their passion, their energy, their verve! They’ve lost their spark! Leading has become ‘all too hard.’ Many are tired – of doing the number crunching, sorting out ongoing workplace conflict, trying to make a difference for their company in an ever increasingly competitive world. The fun isn’t there anymore. The ‘joie de vivre’ left a while back. Why Do You Need To Read This Report? If you are in business, it can only benefit you to improve your leadership skills, and also empower your whole team to take on leadership behavior. The most common reasons why good relationships at work suffer and conflict walks in the door are misunderstanding others and not listening well. How to turn them from agony to ecstasy, where possible. I’m a people watcher. Have been for 25 years. I got into the business of psychology and organizational development over two decades ago, having studied for a lot and taught psychology at University for much of that time, and since then, I have observed a lot of relationships. Usually $29. Free download – limit 1 per person.